NEW YORK This Christmas travel season could be the busiest in six years, with AAA predicting that 93.3 million Americans will hit the road. That's 1.6 percent more than last year and just 400,000 people shy of the 2006 record. More cars will crowd the highways than ever before, largely because finding a seat on a plane at a desirable price has gotten more difficult. 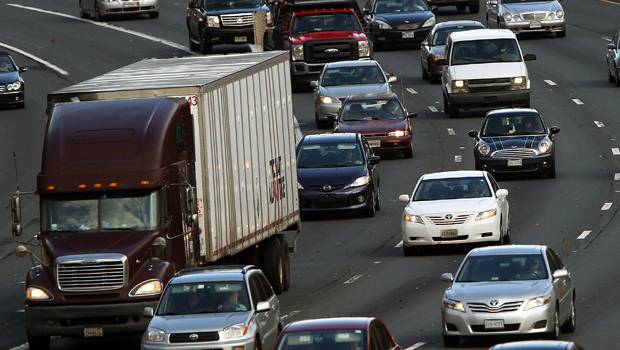 AAA says a record 84.4 million people will drive at least 50 miles between Dec. 22 and Jan. 1. That's 90.5 percent of holiday travelers, up from 89.3 percent six years ago. Put another way: one in four Americans will be driving long distances for Christmas and New Year's. So expect plenty of traffic jams, crowded highway rest stops and overflowing toll plazas. The price of gas could be close to the average of $3.23 a gallon that drivers paid last Christmas Day. The price has dropped about 50 cents since September. AAA estimates the average price will range between $3.20 and $3.40 a gallon by New Year's Day, according to AAA. That's pricey, but hardly a deterrent to holiday travel. "The year-end holiday season remains the least volatile of all travel holidays as Americans will not let economic conditions or high gas prices dictate if they go home for the holidays or kick off the New Year with a vacation," say AAA president and CEO Robert Darbelnet. The travel forecast done by IHS Global Insight for AAA, one of the nation's largest leisure travel agencies, is based on interviews with 655 Americans and factors in estimates about the overall health of the economy. While about 1 million more people will driver, fewer will travel by plane. Airlines for America, the industry's trade group, estimates that about 15 million people will fly between Dec. 17 and Jan. 6. The group says there will be 42 million segments - a takeoff and landing - flown by passengers. That's about 300,000, or 1 percent, fewer segments than last year. Planes will also be fuller than last Christmas. The group's chief economist John Heimlich expects 86 percent of seats to be filled with paying passengers, up from 85 percent last year. That number could climb to 90 percent on the busiest days: the weekend before Christmas, the day after Christmas and Jan. 2. Once fliers arrive, they'll pay more for hotels and car rentals. AAA three diamond lodgings are forecast to cost $129 a night, up $3 from last year. Two diamond properties are also up $3 a night to $95. Daily car rental rates will average $56, compared to $40 last year.